Videvo User Accounts is Finally Here! Develop a public profile, allowing you to promote your own website, Twitter profile etc. The main thing you will notice is that you now need to login in order to download clips. This is a feature we have had to add to prevent the site being abused by bots and automated programs as it has been in the past. There are no download limits, so once you’re a member you can browse the site freely and unrestricted as you could before. By becoming a member you have the option to receive news and updates via email — this is completely optional but recommended (we won’t spam you don’t worry!). This is one feature we’re particularly excited about, and we can’t wait to see how it develops. Once you’re signed in you can upload your own clips, giving you the opportunity to help out others with their projects and participate in the growth of Videvo. Currently the upload feature is very simple, but effective. We accept clips in either .mov or .mp4 standard, and with a file size limit of 100Mb — for this reason we recommend short clips (10-15 seconds) compressed using the H264 codec. We will be writing a blog post about this shortly. Once uploaded your clip will be moderated by our team, and either accepted or declined — in almost all cases providing the quality is high your clip will be accepted. Needless to say you must own full copyright to any clips you upload. Once we’ve checked over your clip, you’ll receive an email confirmation from us, and your clip will appear on the site, as well as your public profile. 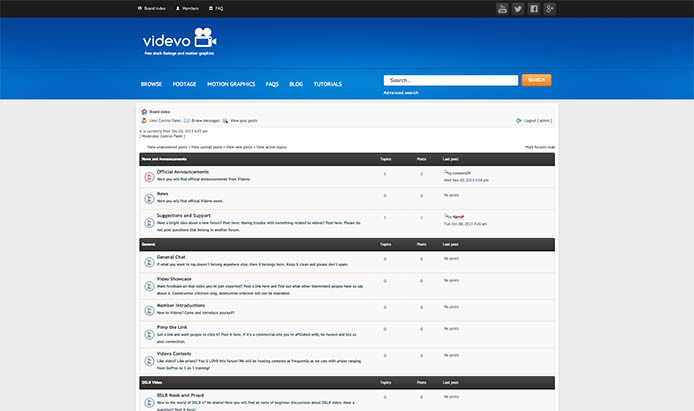 To go alongside user accounts we have also launched the Videvo forums, where you can discuss, debate and learn all things production related. One of the big advantages of being a Videvo member here is you can contribute to the conversation, as well as privately message other members. As with every forum, spam will not be tolerated, as we’re aiming to provide a rich user experience. Over time we are hoping this to grow into a fantastic resource for the Videvo community, so if you’re interested in becoming a moderator do get in touch. In your profile section you have the opportunity to promote yourself a bit — you can add a profile picture, a short bio about yourself as well as links to your website, Twitter profile and Google+ profile. This will all be viewable by other members through your public profile, which also displays videos you have contributed to Videvo in a portfolio-style layout. In future we will be running competitions and promotions, which will only be available to members. Whilst we can not say much more about it at this stage, we’re pretty excited about it and I’m sure you will be too. Overall the new changes are designed to improve the user experience and help the site to grow in the coming years. Our vision is that it will create a community of video producers exchanging content and ideas freely, and in the process hopefully having a bit of a laugh too. As ever we’re keen to hear your feedback, so please either leave comments on the forum, or email us at hello@videvo.net – there are still a few bugs, so if you’re experiencing any issues downloading/uploading or any other problems do let us know! We hope you enjoy user accounts and catch up soon.